If Ramakant Keshav Desphande, founder of the RSS-affiliated Adivasi Kalyan Ashram, were alive, would he be proud of this achievement? Nearly 10 years after he passed away, his photograph hangs just above the god's idol in a thatched-roof temple in New Chingsa village, from where it looks upon the devotees. In row with Desphande's photograph are paintings of Swami Vivekanda and Buddha. It's quite a feat considering that New Chingsa is a village of 80-odd Tangsa tribal families in Changlang district, Arunachal Pradesh, bordering Myanmar. It is all the more incredible because Tangsa people have traditionally been animists, with their supreme spirit, the Rangfraa, not bound to temples, idols or any form. On a Sunday morning, the atmosphere in the temple in the New Chingsa is frenetic. "Jai Rangfraa, Jai Rangfraa, Jai Rangfraa." The devotees' incantations pick up a feverish pace as the half a dozen priests standing near the idol slip into a trance, shaking and shivering. The Rangfraa idol looks like a Mongoloid white Shiva. This Shiva-like Rangfraa is a creation of the RSS affiliates who have converted the animist belief system of Tangsa in to a sect of Hinduism and Rangfraa into a clone of Shiva. The Tangsa, migrants from the Indo-Tibetan plateau, number about 21,000 today and are classified as "other Naga tribes". Initially animists, many of them converted to Christianity with the advent of missionaries - mostly Baptists. The rest remained true to the animist Rangfraa beliefs. The RSS affiliates, famous for converting tribals to Hinduism in central India, are having a field day now in Arunachal just as the missionaries had earlier. And, it's a relatively discreet effort. The Rangfraa cult is not their first project. Donyi Polo, a syncretic new religion, has already spread through the Abotani central belt of the state and Intayism similarly has been established in the Idu Mishmi tribe. Shivling keep propping up across the state, marking new territory for the project. In the late 1990s, the RSS worked with some Tangsa leaders, including L Khimun, an engineer, to hold a painting competition at Changlang. Khimun says he and others were working to set up a society for reforms but realised it needed a religious tenor. Then he met the RSS. The painting competition was held to give a form to the god, Rangfraa. "More than 100 people participated. The winning painting just happened to look like Shiva with some traditional imagery. The painting was sent to Jodhpur. From there came the first 300-kg marble sculpture of the Rangfraa in 1997," tells the soft-spoken Khimun, now the secretary-general of the Rangfraa Faith Promotion Society. The RSS affiliates paid part of the cost of the making and transporting of the idol. Khimun has written several holy books codifying the religion. They seem to pick ideas and moral lessons from all over but affirm that Rangfraaism is a part of the Hindu fold. Of the role of RSS and its sister organisations, he says, "They are always with us to guide and help. They provide training and resources. People from Nagpur come here at times." "We have made a key contribution to the movement," says Kampa Taisam, the Miao block president of the Arunachal Vikas Parishad, a RSS organisation. "We distribute medicines, hold medical camps and other activities and contribute to the cost of building temples." He is also proud of his meeting RSS head Mohan Bhagwat in Nagpur. The cult or religion now has about 1,000 members from the Tangsa, Tutsa and Nocte communities spread across Tirap and Changlang districts. That is still only two to three per cent of the total population of the three tribes put together. Many villages have Rangfraa temples now and village-level convenors. For the RSS, looking to convert tribals to Hinduism, Arunachal Pradesh has been a ripe fruit to pick. About 20 main tribes, with hundreds of sub-tribes, are spread sparsely over difficult terrain. In towns, the relatively better off, still bound to traditional filial structures, have modern aspirations and seek to create a unique identity that gels with the rest of India. In villages, the poorer survive abysmal infrastructure in a state of near disconnect from the world outside. There is a strong sense of alienation but it largely does not boil down to secessionist desires. Many students from the state have passed through Vivekananda Kendra schools, imbibing the basic tenets of Hinduism and learning Hindi, which is spoken along with Assamese between tribes. "They provide basic health facilities and education. The missionaries do the same. The state is all but absent when it comes to providing the basics. They come and fill the void," says a young Tangsa leader. The anti-Christian subtext remains strong in the new Rangfraa religion, which conflates Hinduism with nationalism. There has been violence on occasions in the state between Christian tribals and the revivalist groups. "As per our definition, all those who are willing to die and live for Hindustan are Hindu. Those who are anti-Hindu or anti-national, they criticise Rangfraaites. Especially the Christians, I shall say openly," says Khimun. His holy books speak of the need to reconvert proselytised Christians. Khimung says about 100 Christian tribals have converted to Rangfraa so far. But the Rangfraa project has not yielded an exact replica of the Gangetic-belt Hinduism. The tribals of Arunachal Pradesh are not as vulnerable as many in Central India to cede their identity in entirety. The new gods have given birth to syncretic religions, borrowing symbolism and ideas and traditions freely. If the shaman-based system of earlier beliefs have been shun, new "mediums" have emerged providing cure and miracles. The cult has banned sacrifices of animals for rituals but going vegetarian is just an ideal. People adapt to live complex lives with several gods, benefactors and belief systems. The project is also yet to led to any political gains for the BJP thus far. Clan and tribe relations overpower most other dynamics. "No, people won't accept our involvement in electoral politics yet," says Kampa Taisam. In Miao town, the Arunachal Vikas Parishad is still a family enterprise that he, his brother and wife run. The irony is that these people are incidental to the larger project of Hinduisation just as they remain incidental to the Central government's strategic regulation of this frontier. Morphing lives, traditions and cultures of the Tangsa or thousands others living in villages, like New Chingsa, hardly bothers either's strategy. RajeshA wrote: Those who made the Matrix triology, modeled the Matrix on Indian Secularism. Social Media is red pill. Guess who is Neo! Added Later: It seems Rajiv Malhotra has been playing the role of Morpheus! Malh( wrestler)-( Nasty)Otra 's tweet last night was interesting. He now gonna work on Reconstuction, Recreation and Revival of all that was civilisationally lost in the past. RNIs are going to get nasty jolt soon. IN EARLY AUGUST LAST YEAR, a cohort of journalists gathered in Kolkata for a two-day seminar on Islamic fundamentalism convened by the Rashtriya Swayamsevak Sangh, the world’s largest non-political voluntary organisation and the eighty-eight-year-old bedrock of Hindu nationalism in India. This was the first time the RSS, also known as the Sangh, had held such a workshop—one in a series of four, aimed specifically at journalists, on issues of significance to the organisation, including politics in Jammu and Kashmir, scheduled castes, and development. Only ideological devotees were allowed in. According to the RSS’s annual report, the four events—the others were in Delhi, Bangalore, and Ahmedabad—drew 220 participants from across the country. In Kolkata, the RSS’s prachar pramukh, or head of promotion, and the chief organiser of the event, Manmohan Vaidya, laid out the objective: to help journalists understand the nuances of the RSS’s position so they could better project the Hindu nationalist point of view. The participants were instructed that the seminar was not to be reported on, or talked about outside RSS circles. “During some sessions, we were asked to let it go in one ear and out the other,” a journalist and swayamsevak, or RSS volunteer, who works for a regional newspaper, told me. At one point, Shrirang Godbole, a homeopathic doctor from Maharashtra who serves as an Islam pundit within the Sangh, explained that the Muslim community is not monolithic, but is riven by divisions just like Hindus are by caste. He then expounded on how even “benign” sects such as Sufism have a violent past. “Some of our leaders pay homage to Sufi saints without proper understanding of history,” Godbole told them, as a slide showing the BJP leader LK Advani at the dargah in Ajmer, Rajasthan, popped up on a screen. The swayamsevak-journalist said it generated a lot of laughter—even from Mohan Bhagwat, the RSS sarsanghchalak, or supreme commander, who was present throughout the workshop. MOHAN BHAGWAT is arguably the most powerful outsider in Indian politics today. Although the RSS publicly eschews politics, Bhagwat’s organisation supplies much of the ideological and strategic direction, as well as many leaders, to roughly three dozen affiliate groups across India. This includes the country’s largest trade union, the Bharatiya Mazdoor Sangh, which boasts over ten million members; the country’s largest student union, the Akhil Bharatiya Vidyarthi Parishad; and the country’s main opposition party, the BJP. The Sangh and its various offshoots, collectively known as the Sangh Parivar, or Sangh family, run more than 150,000 projects across the country, including educational, tribal welfare and Hindu religious programmes. The sarsanghchalak is considered the “guide and philosopher” of the entire movement. Since he was elevated to the post in 2009, Bhagwat has skilfully rallied the RSS and its affiliates to help the BJP prepare for and fight what have become the most significant elections since 1971, when Indira Gandhi took the Congress party to a massive victory and consolidated her personal power. Bhagwat’s comments in Kolkata captured a large part of what now seems to be at stake: the ascendancy of the BJP and its prime ministerial candidate, Modi—and therefore of the RSS’s vision for India as a Hindu nation. But they also reflected long-standing frictions between the RSS and its most conspicuous offspring. For two decades, since the climactic destruction of the Babri Masjid in Ayodhya and the subsequent establishment of the first BJP-led government, there has been a widening chasm between the RSS, whose full-time members are supposed to practice a celibate austerity meant to keep them singularly focused on the fulfilment of the organisation’s aims, and the leaders of an increasingly fractured BJP, who are often seen to be lusting after modern luxuries and personal power. Many in the party believe that the RSS does not understand politics. “The Hindutva element of the party has increased over the years,” a senior BJP leader and former cabinet minister in the party’s National Democratic Alliance government told me. “People with inadequate political understanding are pitchforked into the party.” For their part, RSS leaders contend that the party has compromised its ideology and strayed too far from RSS influence. To a great extent, Bhagwat has already begun to stall the drift in the Sangh family. In the five years he has headed the RSS, he has displayed a remarkable pragmatism in the way he combines authority and persuasion to govern the organisation and its offshoots. He has clawed back a significant amount of control over various affiliates, reining in openly militant arms such as the Vishwa Hindu Parishad and the Bajrang Dal. Shakhas have begun to modernise, with training sessions now occurring at more (and more convenient) times, and even being conducted over the internet, for RSS members abroad. The organisation’s prachar vibhag, or publicity division, has gone into overdrive, creating a powerful presence on social media. Bhagwat has also deepened the RSS’s influence in the BJP, helping to choose party presidents, mobilise Sangh workers and volunteers ahead of the elections, and smooth the way for Modi’s ascent. Modi, who joined the RSS at age eight and once served as the organisation’s official liaison within the BJP, has also been a boon to, and a lodestar for, the Sangh. In the persona of the Gujarat chief minister—who projects a masculine Hindu pride while seeming to embrace a pragmatic economic philosophy and sporting a Movado watch, Bulgari spectacles, and Montblanc pens—the RSS may have found a way to resolve, or at least dissipate, the tensions between its ethos and the exigencies of contemporary political life. He has also helped to fire up the Sangh cadre. The former NDA cabinet member with whom I spoke told me of a common saying in the BJP: “soochna aai, sochna bandh”—the direction has come from the RSS, so stop thinking. But the RSS has always maintained that politics and politicking are not its proper work, even though it admits, sometimes grudgingly, that it shares an ideology, advice-on-demand and workers with the BJP. At least half a dozen senior RSS leaders, including the national executive member Madan Das Devi, who was formerly the Sangh’s official liaison to the BJP, told me that the RSS has nothing to do with the party’s internal affairs, and that the BJP’s decisions are the BJP’s alone. LK Advani, once a full-time RSS worker, has compared the RSS–BJP relationship to the one between Mahatma Gandhi and the Congress. Since then, the RSS has carried out a massive mobilisation of its volunteers—“the biggest since Emergency,” the deputy told me. Thousands of its workers are on the ground registering voters, updating electoral rolls and campaigning door-to-door to achieve 100 percent voting. Officially, Sangh volunteers are not allowed to canvas for any particular party, but this is an order honoured mostly in the breach. One swayamsevak I spoke with in Delhi’s Sarojini Nagar area said he went around to nearly four hundred houses handing out a flyer on important issues: one side of the sheet discussed urban economic concerns, such as roads and utilities; the other side touched on the RSS’s pet political themes, including terrorism, Pakistan, and “flying the tricolour at Lal Chowk” in Srinagar. The sheet also read, “Do you know who has achieved all of it? One ordinary man in Gujarat.” After handing it out, “we would tell people to vote for Modi,” the swayamsevak said. The RSS’s ambiguous relationship with politics, and by extension with the BJP, has its origins in the RSS’s early decades, long before the founding of the party, in 1980. Dr Keshav Baliram Hedgewar formed the RSS, in 1925, to create a large pool of disciplined, physically strong leaders who would provide direction to Hindu society. Hedgewar modelled his organisation on the British army, with a similar uniform and training in armed and unarmed combat. Swaroop said, “the crisis of goal started in the RSS after Independence, because the goal of Independence was achieved without RSS.” In this period, a combination of influential leadership and historical cataclysm forced the organisation away from a direct engagement with politics. The highly revered second sarsanghchalak, MS Golwalkar, took over in 1940 and subsequently became venerated as “Guruji.” (Hedgewar briefly handed the RSS over to LV Paranjape in 1930, but Paranjape is usually not included in the reckoning of its chiefs.) Golwalkar saw the RSS as primarily a social, cultural, and even spiritual body that ought to shun politics, and he kept it out of the anti-colonial Quit India movement. This apolitical stance solidified in 1949, when the government lifted a ban on the organisation (which was imposed after the assassination of Mohandas Gandhi, the previous year, by members of a Sangh affiliate). The RSS reciprocated with the promise made in its constitution. Ever since, the RSS’s involvement with politics has often been at arm’s length in public, but intimate and complex behind the scenes—mainly because most of the top leaders of the now defunct Bharatiya Jana Sangh party, founded in 1951, and later of the BJP, came from and owed their primary allegiance to the RSS. While Golwalkar was chief, Deoras had abandoned the RSS for at least half a dozen years because of a dispute with the sarsanghchalak over the organisation’s direction. As soon as he took over, Deoras plunged the Sangh family into several political agitations, including the one that led to the Emergency. Afterwards, the political scientist Pralay Kanungo writes in his book RSS’s Tryst with Politics, Deoras realised that “to remain in the mainstream of national politics” the RSS had to publicly “opt for the politics of accommodation.” This “realpolitik” led the Sangh to merge its political arm, the Jan Sangh, into the ideologically diverse Janata Party in 1977. In the past fifteen years, first in the powerful post of RSS general secretary and then as chief, Bhagwat, too, has worked hard to assert the organisation in the political sphere, and to contain the conflicts between it and the BJP. That the party is now so openly reliant on the RSS is partly a mark of his profound influence. Many Sangh veterans told me that Bhagwat—whose father and grandfather were both RSS members and whose walrus moustache gives him an uncanny resemblance to Hedgewar—has picked up where Deoras left off. DEORAS’S BELIEF THAT electoral politics could help the RSS refashion the nation in the organisation’s own image got its first major test in the late 1990s, when the BJP came to power at the head of an NDA government led by the RSS swayamsevak Atal Bihari Vajpayee. Ironically, the BJP’s years in power proved to be difficult ones for the RSS, as the party—made popular by a vigorous economy, and a dynamic foreign policy that projected supremacy over Pakistan and reset relations with the United States—elevated itself above its parent organisation. From its inception, the RSS’s emphasis on Hindu exceptionalism had brought it into conflict with the brand of secularism espoused by the then dominant Congress. When the Jan Sangh was resurrected as the BJP, in 1980, the party explicitly adopted Gandhian socialism as its guiding principle in order to keep allegations of communalism at bay. In the 1984 general elections, the BJP was reduced to two seats in parliament; many believed that the RSS had refused to campaign for the party and even voted for the Congress. In the following years, the BJP embraced Hindutva when it saw the amount of public support the RSS and the Vishwa Hindu Parishad attracted during the movement to build a Ram temple in Ayodhya. In June 1989, the BJP’s national executive met at Palampur in Himachal Pradesh. It passed a resolution drafted by Advani that formally put the party at the vanguard of the movement, thereby paving the way for the most communally divisive period in the history of India since Partition. From that day, the BJP, which had been one among many galleons in the RSS armada, became the flagship of the Sangh in the public imagination. Vajpayee demonstrated his independence from the RSS early in his premiership. On 6 August 1999, four pracharaks were kidnapped from a Sangh-run student hostel in Tripura and taken to a camp in Chittagong, Bangladesh. The RSS blamed the Baptist Church and separatist insurgents of the National Liberation Front of Tripura, and pressured the government to send troops across the border. But both Vajpayee and the home minister, Advani, were reluctant to create an international situation, and the government never took military action. A slower burning but ultimately more incendiary conflict ignited over the Ram temple movement. Madan Das Devi told me about a meeting at the prime minister’s residence, early in the NDA’s term, at which he, Vajpayee, Advani, the RSS sarsanghchalak Rajendra Singh (who took over from Deoras in 1994), the RSS joint general secretary KS Sudarshan (who would take over from Singh in 2000) and the Vishwa Hindu Parishad leader Ashok Singhal were present. “Singhal really fired into Advani,” Devi said. “The feeling was that the Ayodhya land could have been given to the VHP.” The VHP leadership felt the NDA government belonged to them, and was letting down the cause—that the swayamsevaks and pracharaks in the government had ditched their ideology and roots. “One of the leaders of the government at the time said, ‘Why are we calling ourselves a party with a difference? We are the Congress with a tinge of saffron,’” KN Govindacharya, who was then a party general secretary, told me. After Sudarshan became sarsanghchalak, “those in the RSS themselves began to believe that the BJP leaders had become bigger than them,” Sudhir Pathak, the soft-spoken former editor of the RSS’s Marathi newspaper, Tarun Bharat, told me. A decade earlier, at the height of the Ram temple movement, the RSS leadership had seniority and authority over the BJP. But by 2000, that was no longer the case; Advani, the second most powerful person in the party, became a full-time member of the RSS far before the new chief did. For the first time, there was a tussle over who should guide whom. Within the BJP, Sudarshan, who was considered autocratic and whimsical, was an unpopular choice to lead the Sangh. Dilip Deodhar, a businessman in Nagpur, where the RSS has its national headquarters, grew up in an RSS family, is a long-time swayamsevak, and has been close with many senior leaders of the RSS; he said that when an ill Rajendra Singh first hinted that he was considering Sudarshan as his successor, in 1998, BJP leaders, including Vajpayee, asked Singh to postpone the decision. They told the organisation’s then general secretary, HV Sheshadri, that it would be “difficult to run the government even for a day” if Sudarshan became the RSS chief, Deodhar said. Soon after taking over the RSS, Sudarshan tried to exert himself over the rest of the Sangh, including the BJP. Before an RSS function at a stadium in Delhi, for example, he issued instructions that nobody, including the press and NDA ministers, should be allowed in if they did not turn up in the RSS uniform, including the black Gandhi cap, long-sleeved white shirt with the sleeves rolled up above the elbow, and khaki shorts. None of the ministers—including Vajpayee, Advani and the education minister, Murli Manohar Joshi, all of whom had been swayamsevaks for several decades—attended. The then BJP president, Kushabhau Thakre, who was widely credited with building up the Sangh in Madhya Pradesh, arrived in the uniform but forgot to bring the bamboo staff that completes it. According to Deodhar, Thakre was asked to go back. Delhi was Sudarshan’s base for much of the time that the NDA was in power. He frequently criticised the government in public, and meddled in ministries. In one characteristic episode, Sudarshan used a combination of Sangh organisational strength and government access to act as a cultural censor. When the director Deepa Mehta was shooting Water in Varanasi, filming was interrupted by RSS and VHP men who burnt down sets and shouted slogans against her, Mehta’s daughter Devyani Saltzman wrote in her book Shooting Water. Mehta was asked to get permission from the RSS chief in order to continue production; otherwise the protests would carry on. When she went to the RSS headquarters in Delhi one wintry morning, Sudarshan came to meet her wearing a heavy shawl, and a saffron balaclava over his face. He walked up to her and quoted a passage from Dante’s Inferno in perfect Italian, then sat down and told her not to misjudge the RSS. “The Ganga is precious to us,” Sudarshan told Mehta. “Have you read the script for Water?” Mehta asked. The RSS chief placed a copy of it on the table. “Where did you get that?” she said. Only one script had been shared outside of the production team—with the ministry of information and broadcasting. Sudarshan said, “After all, whose ministry is it anyway?” He asked Mehta to work with Sheshadri Chari, then the editor of the RSS weekly Organiser, on correcting the script. The RSS’s disaffection with the BJP had become so acute that for a time the organisation contemplated abandoning the party altogether. Among other things, the RSS leadership worried that the power-hungry ways and opulent lifestyles of BJP politicians were corrupting swayamsevaks, many of whom were losing interest in Sangh work. Following the 2004 elections, the RSS top brass, including Sudarshan, Madan Das Devi and MG Vaidya (whose son Manmohan is now the head of promotion) met at a farmhouse in Jhinjholi, on the outskirts of Delhi, to take stock of the organisation’s involvement in politics. Many of the leaders, including Sudarshan, felt that the RSS’s experiment with politics should come to an end. While practically every leader stood arrayed against Advani, according to a former editor at an RSS-sponsored publication, Bhagwat took a soft line, arguing that the RSS should maintain good relations with India’s neighbours, and that the BJP should retain Advani as a sort of mentor. At the same time, he was quietly pushing for youngsters to take the party reins. IN MARCH 2009, just two months before general elections in which the BJP was hoping to wrest back power from the Congress-led United Progressive Alliance, the RSS effected a generational shift when Sudarshan chose Bhagwat, then the organisation’s general secretary, as his successor. The announcement was sudden, but not totally unexpected. The RSS had begun replacing its aging leaders with much younger ones beginning in the late 1990s; although this may have been a liability in short-term relations with the BJP, the organisation recognised the long-term importance of an energetic leadership. When the sixty-eight-year-old Sudarshan was appointed sarsanghchalak, the then general secretary, HV Sheshadri, told him there were two viable options for general secretary—Madan Das Devi or Bhagwat. Sheshadri and Sudarshan were inclined towards Devi, who understood politics and was the official RSS point man for overseeing the BJP. But MG Vaidya advised Sudarshan that it would be prudent for him to put his weight behind Bhagwat. Like almost all RSS decision-making, the selection process was informal, highly consultative, and private. “None of us had even heard his name until he became chief,” a senior editor at a national English-language magazine told me. Bhagwat was just fifty-nine. Mohan Madhukarrao Bhagwat was born on 11 September 1950, in Sangli, Maharashtra, at his maternal grandfather Annaji’s home, into a family of Brahmins with close ties to the RSS. Bhagwat’s paternal grandfather, a lawyer from Satara named Narayan Bhagwat, moved to Chandrapur after his parents died. Narayan, or “Nanasaheb,” was a member of the provincial Congress and a schoolmate of Hedgewar’s at Nagpur’s Neel City School, which threw the future RSS founder out for defying British rule and singing Vande Mataram. Bhagwat’s father, Madhukarrao, became an RSS pracharak in the 1940s and worked extensively for the organisation in Gujarat. He eventually decided to marry, but continued his work with the RSS until Bhagwat was born, after which he enrolled in law school in Nagpur. Bhagwat is the eldest of three sons and a daughter born to Madhukarrao and his wife, Malatibai. The family was steeped in the values of the Sangh. Three generations of Bhagwats have held positions of authority in the RSS. After heading the RSS in Gujarat, Madhukarrao became Chandrapur district chief, a position held by his father before him. Malatibai was a member of the Rashtra Sevika Samiti, the RSS’s women’s wing, and in charge of the Jan Sangh’s district women’s forum. In January this year, I met Ravindra Bhagwat, Bhagwat’s youngest brother, at the family home in Chandrapur, a rapidly expanding Maharashtrian town whose skyline is dominated by the portly smokestacks of a 2,340-megawatt super-thermal power station, the biggest pithead electricity generator in the state. Hanging in the living room was a painting of a tiled two-storey house that originally stood where the large modern building—which includes shop fronts and Ravindra Bhagwat’s office—is today. A collection of mementos and trophies, many of them won by Bhagwat in singing and theatre competitions, were displayed on a shelf. Ravindra said that when Bhagwat returned from university after graduation he carried a gunnysack full of medals and trophies. THE YEAR 1992 WAS A TUMULTUOUS ONE for India. The country was experiencing its own perestroika, launched the previous year by a Congress government led by the wily PV Narasimha Rao, only the third Congress member outside the Nehru-Gandhi family to become prime minister. That April, the revelation of a Rs 4,000-crore stock market scam triggered a tsunami of criticism against the capitalist turn the country had taken. As winter approached, the Sangh family prepared for its kar seva in Ayodhya, a massive mobilisation of volunteers who were supposed to help build a temple to Ram at his purported birthplace on the banks of the Sarayu river. During two months of shooting, Vachani and his production team spent a lot of time at Asha Sadan, an RSS office in a mansion that also functioned as a sort of hostel for volunteers. One of the leaders whom Vachani met there was Bhagwat, who, as the RSS’s all-India chief of physical training throughout the 1990s, oversaw an integral part of character building in the Sangh. Reflecting on the early 1990s, the three main characters in The Men in the Tree—Sandeep Pathey, Purushottam and Sripad Borikar—speak proudly about their roles in the destruction of Ayodhya’s Babri Masjid, on 6 December 1992. The RSS, according to them, had planned the kar seva which led to the demolition, down to the last detail. Pathey says the preparations were so meticulous that everything was recorded—the age of each boy, which train he would travel in, the group leader to whom he would report. Even those who ventured to Ayodhya independently had to register with RSS workers. “It wasn’t possible for just anyone to go there as a temple volunteer,” Pathey says. Many recent RSS decisions, especially with regard to the functioning of the BJP, clearly bear Bhagwat’s impress. On 2 January 2009, as general elections loomed, Bhagwat (who was two months away from being appointed sarsanghchalak), Madan Das Devi and Suresh Soni travelled to Advani’s house for talks with the BJP leadership. “We understand that it’ll be an NDA and not a BJP government, so you decide what you can do, and what you cannot, vis-à-vis our core Hindu agenda. The entire Parivar is firmly behind you, but there should be more such interactions,” Bhagwat said at the meeting, which lasted several hours, according to an Indian Express report. Bhagwat added that the BJP must ensure that “Hinduon ka anadar na ho”—that the Hindus are not shown disrespect. “BJP as a party has to do this,” Bhagwat added. “BJP as a party is not run by the RSS. They have to find a way. Either they have to agree to this or disagree to this. They are free. But our swayamsevaks always belong to us. We are telling them this.” Bhagwat also hinted that the next BJP president should ideally be a leader who is not active in Delhi. A few months later, the appointment of a new BJP chief sent out a clear signal that the RSS was trying to strengthen its grip on the party. According to several people in the Sangh family, including Dilip Deodhar and the swayamsevak who worked on the BJP’s Delhi election campaigns, the first choice was Narendra Modi. Modi, however, said he did not want a national role until the 2012 Gujarat elections were over. Manohar Parrikar, who had been the youngest-ever RSS regional chief and was then in between terms as Goa’s chief minister, was briefly discussed, but he was considered too young to lead the party nationally. Finally, Advani suggested the name of Nitin Gadkari, a Brahmin from Nagpur who has been a swayamsevak since his teens and served as the party’s Maharashtra state president. One of the BJP’s first major decisions under Gadkari’s watch had the stamp of RSS all over it. Barely a week after he was appointed, in December 2009, the results of the Jharkhand assembly elections came out; it was a fractured mandate, with the BJP and the Jharkhand Mukti Morcha getting eighteen seats each, and the Congress and its allies managing twenty-five. A day later, the Jharkhand leaders of the RSS’s tribal wing, the Vanvasi Kalyan Ashram, were called to Delhi to report on religious proselytisation in the state. The RSS felt that if the Congress cobbled together a government, it would give a fillip to Christian conversions. To block the Congress from power, the BJP decided to tie up with the JMM, even though many BJP leaders were against it because of allegations of corruption against the JMM leader Shibu Soren. The BJP had just fought a Lok Sabha election largely on the issue of black money. Sudhir Pathak, and a long-time RSS member with direct links to the Jharkhand leadership of the Vanvasi Kalyan Ashram, told me that Bhagwat was the alliance’s prime mover. But Bhagwat backed Gadkari throughout his tenure, and when it was coming to an end, in late 2012, he let it be known that he preferred continuity. Several people, including Dilip Deodhar and Sudhir Pathak, told me that Bhagwat felt Gadkari should get a second consecutive term, and that Gadkari need not take personal responsibility for the charges against his companies. Finally, on 22 January 2013, income tax officials raided eight locations in Mumbai that were associated with Purti group companies. The addresses proved to be bogus. That day, Bhaiyyaji Joshi and Advani met with Gadkari in Mumbai, and advised him to step down. He resigned that night. With the blessings of Advani and the RSS, Gadkari nominated Rajnath Singh, who had led the party’s reconciliation efforts with the RSS after Advani’s resignation in 2005, to a second term. Singh took over the following day. Mahajan was suddenly gunned down by his brother, in 2006. From that point on, according to Deodhar, Bhagwat began to back Narendra Modi, who had had a hand in organising Advani’s Ram temple agitation, and was then serving his first elected term as chief minister of Gujarat. Although Modi was a good organiser and had strong ideological credibility, many in the Sangh leadership were opposed to him, and he was under criminal investigation in connection with the 2002 Gujarat pogrom. (The investigation is ongoing.) “RSS leaders feared that court cases could go against Modi,” Bhagwat’s friend RH Tupkary, a swayamsevak and well-known metallurgist who headed the Visvesvaraya National Institute of Technology, told me. Tupkary, who said he is about to start work on a book tentatively titled “The RSS Re-Evaluated,” said the leadership’s attitude began to change when Modi swept the 2007 assembly elections in Gujarat; after that, they started seriously considering him for a national role. With a renewed mandate, Modi began to clip the wings of many senior organisation and party members, hardening some sections of RSS opinion against him. But Bhagwat was evidently not concerned: the following year, with much of the Sangh leadership fuming at the Gujarat chief minister, Bhagwat travelled to Ahmedabad to release Modi’s book Jyotipunj, a collection of profiles of his mentors, including Bhagwat’s father, Madhukarrao. “The first time his name was discussed as the potential prime ministerial candidate was in 2011, in Baroda,” a former member of the RSS central executive council told me. “After the scheduled baithak ended, some of us were asked to stay back for a couple of hours. That meeting was devoted to discussing the political situation in the country.” There were more people opposing Narendra Modi at the time than supporting him, the former central executive member added. Over the next two years, however, the discussions continued at meetings in Chennai, Amravati and Jaipur. Throughout this period, the Sangh leadership was collecting feedback from its pracharak network, which unequivocally supported Modi. According to Sudhir Pathak, “There were two views—to take only a secularist line, or to have some Hindutva also. The Hindutvawadi group was in favour of Modi. Bhagwat was not taking sides. Advani had shown that the Hindutva line can only take you up to 180 Lok Sabha seats; if you want to carry everyone along, a sober face like Vajpayee was necessary. But then the argument was that in 2004 we saw how far a sober face could take us. So the leaders sort of agreed that in 2014 Hindutva would be the appeal.” By June 2013, when Modi was chosen to head the BJP’s national campaign committee, virtually every RSS and BJP leader, apart from Advani, had fallen in line. A large part of Modi’s attraction for both Bhagwat and the cadre may be that, despite his autocratic operating style, he has never challenged the Sangh’s fundamental ideology. Rather, he has shown the RSS leadership that the family’s core values can travel even better in new packaging—that designer clothes and talk of economic development can fit perfectly well with hard-line Hindutva. He is a model for swayamsevaks who have embraced the ethos of a consumerist India. THE SARSANGHCHALAK’S ANNUAL VIJAYADASHAMI SPEECH, in Nagpur, is considered the RSS’s most important public address every year. The one that Bhagwat delivered on 13 October 2013 was different in many ways from any that had come before; it was the first time in the history of the organisation that its supreme commander spent a third of the time talking about the national economy and government policy, with specific references to inflation, deficits and currency controls. Biju took the issue to the national joint convener of the SJM, S Gurumurthy, who promised to take action but then ignored the matter. Then, at the RSS national executive meeting in Chennai, Biju spoke with Bhagwat, who he said assured him they would meet again to discuss the allegations. Biju sent two reminders to Bhagwat about their appointment. He soon got a call from the then RSS joint general secretary KC Kannan. Biju told me Kannan said to him, “You want to meet the sarsanghchalak to flag the issues in the SJM, right? He knows about all those issues and has said that he is not going to interfere in such matters.” Rao was finally forced to repay the money, but only after months of protest. THE RSS UNDER BHAGWAT may have updated its economic approach while retaining its ideological soul (the sarsanghchalak’s alleged tolerance for corrupt Sangh workers notwithstanding), and thereby partially overcome one of the most important challenges it has faced in recent decades—how to respond to the cultural upheaval wrought by economic liberalisation. But the organisation has failed to rid itself of a more longstanding existential threat—the bigotry of its members, especially against Muslims. Perhaps these trends are interlinked, and the Sangh, as it adopts a more market-oriented economic position, has found it advantageous to simultaneously reaffirm its aggressively Hindu-nationalist core. Despite the RSS’s continual public denials that it is bigoted or fosters violence in its members, large and small examples of extreme intolerance in the Sangh family—Modi’s Uttar Pradesh campaign manager using the language of “revenge” and “honour” in riot-affected Muzaffarnagar; the head of the VHP calling for vigilante action to evict Muslims from their homes—seem to leak out into the press constantly. Bhagwat himself frequently accuses Muslim men of carrying out “love Jihad” by courting Hindu women. Former RSS members say that these are the attitudes in which the Sangh brought them up. Other pernicious strains in the Sangh seem to have thrived in the past decade. The RSS national executive member Indresh Kumar is named in the chargesheets for the bombings carried out by Swami Aseemanand and other Hindu terrorists between 2006 and 2008, when Bhagwat was the RSS general secretary. Although the investigations are proceeding at a snail’s pace, there is still some chance that Kumar may be charged. (Officials at the National Investigation Agency declined to comment on the cases.) In theory, Bhagwat, too, could come under investigation after Aseemanand told The Caravan in January that the RSS chief sanctioned the attacks. The swayamsevak who worked on the BJP’s Delhi election campaigns told me that one reason the RSS is taking such an interest in these particular elections is that “they fear for their survival.” He said another UPA government might try to entangle Sangh leaders in the terror cases to subjugate the organisation. That possibility may now be remote, but charges and allegations of violence by Sangh members nevertheless hang like the sword of Damocles over the head of the RSS. WHEN I MET the former BJP general secretary KN Govindacharya at his office in East Patel Nagar, Delhi, last October, he told me about an opinion piece that Vajpayee, then a forty-seven-year-old swayamsevak and president of the Jan Sangh, wrote in the Indian Express in 1972. The article argued that a strongly ideological party would never come to power in pluralist India, and could at best remain an influential pressure group. Swayamsevaks have two courses of action, Vajpayee wrote: give up on achieving power; or compromise on their ideology, come to power, and then discharge their responsibilities as RSS men. After the article came out, the Sangh called a meeting of its national leadership to discuss Vajpayee’s views. The sarsanghchalak, Golwalkar, thought that in theory an ideological party could come to power. Vajpayee was not interested in debating possibilities; he wanted clear direction about which path to take. Golwalkar told him that it was up to Vajpayee and his colleagues in the party to choose. NANDIGRAM: Trinamool Congress chief Mamata Banerjee on Saturday dared BJP prime ministerial candidate, to implement his promise of sending Bangladeshi's packing after May 16 if his party came to power, saying that the 'paper tiger' should first meet the 'Royal Bengal Tiger'. "Touch a single person, we will see. The paper tiger should know there is a Royal Bengal tiger in Sunderbans. First you face that," Banerjee, the chief minister, told an election meeting here. Claiming that the Gujarat chief minister did not know history, she said that Bangladeshis came to India under a pact signed in 1971 by then Prime Minister Indira Gandhi and Bangladesh President Sheikh Mujibur Rehman. "He does not know that speaking in Bangla does not make one a Bangladeshi. Anyone who speaks in Bangla across India is branded a Bangladesh. This is discrimination," she said alleging that Modi wanted to to divide Bengalis and non-Bengalis. At a rally in Serampore on Sunday, Modi had said that Bangladeshis should be ready to pack their bags after May 16, the date of counting for the Lok Sabha elections. She reiterated that one who did not follow secularism could not become the Prime Minister. Banerjee also dismissed BJP President Rajanath Singh's overture of a 'handsome package" to West Bengal if the NDA came to power, saying she did not want it, but interest on loans being deducted by the Centre should be returned. "We do not want a package. We do not want alms. We want return of money deducted by the Centre forcibly for the loans taken by the previous Left Front government," she said. She claimed that the Centre deducted Rs one lakh crore as interest from the state. Seeking to reach out to the Trinamool Congress Rajnath Singh at an election meeting at Naihati yesterday had said that a 'handsome package' would be given for the development of West Bengal if his party formed the next government. The BJP chief's overture to Banerjee came a few days after the two parties locked horns over Narendra Modi's attack on the TMC chief on April 27 at a poll rally in Serampore in Hooghly district. A person born in India on or after 26th January, 1950, but before 1st July, 1987, is a citizen of India by birth irrespective of the nationality of his/her parents. A person born in India on or after 1st July,1987, but before 3rd December, 2004, is considered a citizen of India by birth if either of his/her parents is a citizen of India at the time of his/her birth. A person born in India on or after 3rd December, 2004, is considered citizen of India by birth if both the parents are citizens of India or one of the parents is a citizen of India and the other is not an illegal migrant at the time of his/her birth. Also, it is important to keep in mind that even those migrants who came to India befoe the cutoff date of 24th March, 1971 would become fully legal citizens of India only upon going through the process of naturalization. It seems not just Bangladeshi govt. is unwilling to accept illegal Bangladeshi immigrants back, not even those who entered after March 24, 1971, but even Indian politicians are willing to not heed to Indian Law. Also the question is whether India should hang on to the provisions of the Peace Treaty even though Bangladesh has been found to violate it in the past by helping many insurgent groups against India. Perhaps then we need to ask why the Persians and the Afghans are so keen to call themselves 'Ārya'! RajeshA wrote: Perhaps then we need to ask why the Persians and the Afghans are so keen to call themselves 'Ārya'! Because they've been told over the last 150 years its a racial term, and that they were the ones who took a break from making love to their sheep and inseminated the Dravidian Indians, and 'composed' the Vedas. It also makes them feel closer to the Euros. There's a lot of 'Westoxification' ('gharbzadegi') going around in Iranic circles for over a century and a half now. Persians and Afghans used to proudly call themselves 'Ārya' even before the "Westoxification". That 'Ārya' imagery of self was, I believe, their identification with the 'Āryatva' civilizational meme which spread from Bharat into the rest of the known world. Historian call it "Sanskritization". I call it 'Āryatva' as 'Ārya' was the noblest ideal from the times of Sri Rama and earlier. Persia and Afghanistan, among other regions, were the fruit of the mission, "Krinvanto Vishvam Aryam"! Persian and Afghanistan very proudly embraced the identity 'Ārya' and as you say Westoxification talked them into considering 'Ārya' to mean their race which allowed them to think they shared some racial origins with the Europeans. Perhaps the Persians and Afghans were more than happy to distance themselves from a subjugated Bharat and reconnect themselves in some distant way with the emerging European powers. I hope we Bharatiyas re-embrace 'Āryatva' as our central civilizational identifier and consider 'Bharatiyata' its very core. RajeshA ji, yes they were allowed to call themselves 'Arya' before their Islamization and then Westoxification. And deservedly so. In an Upanishad it is suggested that Vedically educated men are to be found in Gandhara. But then their region also got to be called 'Avaganasthaana' - Land of semi-civilized tribes', too. So they have no business calling themselves 'Arya' anymore unless they recognize and adopt the culture of an Aryavrata - farhang-e-Aryaee. They need to be disabused of the idiotic notion that 'Arya' is a tribal identity. From Bharatiya perspective, where 'Āryatva' originated and was nurtured, any other people would hardly be able to meet the high standards. Important is that other people too saw 'Āryatva' as a civilizational ideal and wished to rise to the ideal and thus identified themselves with that ideal. We need to again make it the foremost ideal but the light, the polish in the 'Āryatva' diamond can solely be realized by Bharatiya Sabhyata, by us Bharatiyas, which means it is we who need to again be the richest, strongest, most cultured, most humane, most beautiful, most technologically proficient, most skillful, most driven and most proud people among all humanity. Realistically speaking, I don't think we can reclaim 'Ārya' as our civilizational identifier from the Europeans and Iranians unless our civilization again starts expanding internally as well as externally. As they say, history is made by the victors. RajeshA ji, that's true. But even in our current compromised state, one finds that neo-Zoroastrian movements that harp on 'Aryan race' nonsense like to link themselves with India - albeit selectively. When it comes to race, they go to a ridiculous extent to identify with Europeans, but when it comes to philosophical substance and spirituality, they like to tag onto India. So even in our sorry material condition, and the condition of our degraded Sabhyata, it is noteworthy that people still find an attraction, purely on the basis of the accumulated Sanskriti, and its few living exemplars. I don't think it will be too difficult to finish off the big "Aryan race" hoax that Western colonial 'historians' and 'Indologists' invented, once India comes into its own, both politically and materially. Getting the Iranics to defect might be especially facile, given their dozens of contradictions and inflated self-delusions in their identity-manufacturing twists and turns over the centuries. Just a few months back I was chatting with an Irani student in India. He was darker-skinned and rather drunk, and was lamenting that he didn't understand how he ended up dark when Iranis were supposed to be "Arya" and therefore blond and blue eyed - of which there are relatively few in Iran anyway - minus the omnipresent hair-dye, nosejobs and eyelenses. He figured there must be Arab admixture, and was rooming with an Iraqi friend. When I told him that this Aryan-race theory was a ridiculous hoax, he was so delighted that days later he wanted me to repeat some of the facts to him while he was sober - just so he could make sure he got all of it. Iran can be incredibly racist about darker skin, and the Turko-Iranian tribes that were earlier looked down on as nomads (even in 1920, about 30% of Iran's population were nomads) now strut their (usually) lighter features. Typical Persian features were historically described as being darker, since the center of Irani civilization was in traditionally in south-Iran, but switched to the north relatively late, and then it became a fashion to get wives from the Caucusus. Another Irani acquaintance who was hoping to marry a Tajik girlfriend from the Pamirs was telling me how those fair-featured Pamiris were the last remaining "pure Aryans" after the Arab/Mongol conquest of the region, since they lived on mountain-tops and so defended themselves from darker skinned conquerors. I suggested to him it was absurd to think these relatively primitive and peaceful Pamiris were unreachable by the others who ruled everything around them for centuries, and when their spiritual leader, the Agha Khan, was himself supposedly a Sayyid. Rather, I suggested that perhaps in a racially very diverse region, the lighter skin types chose cooler climes to settle, as it happens to be the case in many parts of India or other parts of the world, too. The common sense of it seemed too cruel for his romanticism, but he feebly offered "historians' proof" in defence. Another friend, a Persian from the south, was rather European looking, while most in her family weren't. This is quite common in Khuzestan, where the odd member in the family is Euro-looking. The British and other Euros interested in oil had spent a lot of time in that part of Iran, and it is well known in Iran that they sowed their wild oats. She was rational enough to admit it herself, and joked that they had all surely been 'raped'. This sacralizing and romanticizing of "white race" is an interesting meme. Personally, I don't think there is anything wrong with it per se - it is just one of those facets of human nature. What's attractive is attractive, and one may choose to possess it. But it is a problem when it is mixed up with other human considerations via lies and manipulation of low self-esteem - a Kaliyuga phenomenon of perversion of all human considerations, including Beauty. This phenomenon of confused considerations is a spiritual obstacle not only to those who envy it, but also to those who possess it in any degree. So, as you said, this lies and confusion has to be undone via proper thinking, facts and demonstration of something superior to remove the delusion. I completely disagree. If anything, what we call "Hinduism" is the most reformed and reformable faith system. That is at least one of the secrets of its survival as the longest continually practiced faith. JeM in the Narendra Modi thread. Will continue here. IMO and i've stressed that for long, nomenclature of indic thought and cultural/ class division, religious and panth/ moksha margs has been thoroughly messed up by those that arrived in India from societies seeped in excluvist thought. It started with the Muslims from the ME and continued with the British and other Europeans. Dharmic society was always culturally fluid. The way i have approached the whole issue is asking what various well established historical figures really stood for, defended, fought for, upheld. I find across board that they were defending something called Dharmic 'values'/ principles. This cuts across all sampradayas/ panths/ moksha margs. It was not too difficult to see what ideals this meta ethic stood for. They again cut across all sampradayas/ panths/ mokhsa margs. So clearly we had a society where the Ruler and his subjects wanted to abide by the ideals of Dharma. Within that society emanated Moksha Margs/ Sampradaya's that had their own Guru's, teachings, pracharaks etc. As it was truth search based, debates between practitioners to refine and hone the marg were often carried out. Common denizens respected those sampradaya stalwarts. But then another question from so many Sanskrit texts of yore, every Dharmic was not necessarily attached to a Moksha Marg, Sampradayic panth. He/she chose them as and when the calling came. It became also acceptable that living in a Dharmic society and respecting the various Guru's/ Avatars. Yet even as the Dharmic ideals were known though not very constitutionally formalized, cultural aberrations kept arising. To curb these changes, Guru's, reformers kept arriving in Dharmic society and instead of rejecting core Sampradayic or Dharmic meme's used these very memes to clear society of those aberrations. The very nature of the society based on Dharmic constitution is pluralist and provides choice and freedom to the individual to choose their Sampradayic panth. Thus in 1 family we had and still have Buddhists, Vaishnavs, Jains, Shaivites, Dvait, Arya Samaj, Hare Krishna Bhakts and so on. Even today when even an arranged marriage takes place an Arya Samaji barely bothers whether the spouse is Dvait, Advaita, Vaishnav and so on. If at all the choice ever came it was not due to religious connotations but due to cultural reasons e.g, a vegetarian Jain girl may not like to marry a boy that fond of beef or meat (as a not too common place example). Even today till a certain extent Art 25, Clause 2 (b) of the Indian constitution acknowledges this fluidity. With the advent of excluvist ideologies, those people tried classifying things that shouldn't have been classified in the first place. This fluidity and the realm of debate is one big Dharmic identity, however much we may personally disagree with the tenets of one sampradaya or the other. As long as that big Dharmic identity with it's inherent internal fluidity exists the pluralism will exist too. As long as the ideals of Dharma exist we shall be not only pluralist but also engender forces that will eliminate cultural aberrations. That is why constitutionalizing of the Dharmic meta ethic ideal is a very primary need of the moment. Both to correct mistaken nomenclature and to secure the fortress against excluvist agenda and ideology. Thus even Modi's 'Hinduism is a way of life' is both true and false at the same time. The larger Dharmic meta ethic may have a cultural component as a way of life that has nothing to do with the orthodoxy of religion (even as the SC interpreted it), yet it is patently false as many sampradayas/ moksha margs within the meta ethic do exist on par with the orthodoxy of any known religion. The way of life is a the non orthodox non religious component of the Dharmic meta ethic. It is not the entire thing. So while we may have from time to time, whether on our own or under external influences have been subject to 'Adharmic' cultural practises the ammo to correct always exists within the meta ethic. Also the longest continuity exists precisely because of the universality and naturalness of this meta ethic and the fact that many panths/ sampradaya orthodoxies have been shielded by the meta ethic itself. Thus the calls from the Avatars, Guru's for protecting this meta ethic of Dharma. In my opinion, whenever RSS or BJP leaders use "Hinduism", they mean it as "Hindu-ism" in English and "Hindutva" in Indic languages. On many occasions RSS has said that "Hindu is simply loving, living and dying for Bharat Mata, nothing more"
Some people like to distinguish people on the basis of faith - Dharmics, non-Dharmics, etc. I personally emphasize not faith or worldview, but simply one allegiance to a particular civilizational identity, for us that would be Bharatiyata. But as such nothing wrong in having multiple identifiers as long as they are compatible with each other. The danger for Modi as prime minister, Cohen declares, “Will be from his right and the belief, the theory that America and the United Kingdom are in a conspiracy against India trying to undercut India by being anti-Hindu. They cite The Economist editorial and so forth, saying that there is a plot led by Western missionaries to really attack Hinduism and India. So there’s a danger of a backlash there as well. He will have to defend himself from his right and these extremists position, which is a totally incorrect interpretation of Western policy,” he concludes. What's at Stake in India's Elections? We need a dedicated think tank or institute to put all of this Western and Christian influence, propaganda and influence into hard metrics! Of course anecdotal evidence is also useful, but numbers also need to be a part of the mix. We need to go to people with concrete numbers. We need a whole terminology which frames this soft crypto-imperialism appropriately. All this is heavy research work and needs workers and funding. If in India, we talk about Anti-Conversion Law, then it is imperative that the state partly funds such an institute to gather all these metrics, so that it does not remain just talk and propaganda with claims and counter-claims flying to and fro, but that real data can be presented to the Indian Parliament and people. that their talk of human rights is a cover to put the Hindu on the defensive so that he willingly allows the Abrahamic beast to feast on his flesh. Hindutva is simply the Bharatiya movement for self-determination, preservation of its civilization and resisting imperial aggression by predatory powers and ideologies, but it has been incessantly vilified by the West using all sorts of extremist terminology. It is time to pay them back in their own coin - the most "normal" of their views needs to be laid bare and shown what racism, arrogance, condescension hides behind it. Bharatiyas need to be immune to Western praise or abuse. Only standard by which we measure ourselves is whether our words and deeds are in interest of Bharat Mata or not. Only standard by which we measure the West is through their deeds, past and present, towards Bharat Mata and based on that they receive our scorn or our smiles but never awe or exhilaration. Cohen declares, “Will be from his right and the belief, the theory that America and the United Kingdom are in a conspiracy against India trying to undercut India by being anti-Hindu. They cite The Economist editorial and so forth, saying that there is a plot led by Western missionaries to really attack Hinduism and India. So there’s a danger of a backlash there as well. He will have to defend himself from his right and these extremists position, which is a totally incorrect interpretation of Western policy,” he concludes. How cleaverly he condone the Pedophileous Padrenity and put the blame on victims. This preemptive effort/excuse in hope to keep the long leash provided by Non Goverenment of UPA. RajeshA wrote: but that real data can be presented to the Indian Parliament and people. also comes in handy to counter western (un)"think puddles" on their own turf with the curated verifiable data. If BJP does indeed win this time, the victory will be short lived if they dont change the electoral system. They need to get rid off this first past the post system, introduce run off elections at a seat level, complete elections in at best 2 days to remove voter fatigue and conduct run off's in seats where winner has less than 50% margin within a week. All this has already been recommended to the NDA government between 1998-2004 (National Commission to review the working of the Constitution) report that was commissioned by AB Vajpayee and submitted by Justice M.N. Venkatachaliah to Arun Jaitley (the then law minister). 4.16.4 It has been suggested from several quarters that this principle of representativeness will be fulfilled if the elected representatives win on the basis of 50% plus one vote. If, in the first round, no body gets over 50% of the votes polled, then according to this view, there should be a run-off contest held the very next day or soon thereafter between the top two candidates so that one of them will necessarily win on the basis of 50% plus one votes polled. Several representations from various organizations favoured this option to achieve the objective of better representative democracy. The Chief Election Commissioner is reported to have confirmed that the task of run-off elections can be managed. Actually, the run-off vote is analogous to a re-poll. There is no revision of electoral rolls, no fresh nominations, no fresh campaigning or the like. The Commission is of the view that there are substantial advantages of following the policy of 50% plus one vote. On the one hand, it resolves the problem of inadequate representation. On the other, it also makes it in the self-interest of various political parties themselves to widen their appeal to a wider electorate. It can help push political rhetoric in a direction of mobilizing language might take on comparative ‘universal’ tone as opposed to ‘sectoral’ tones of the present day. With the need to be more broad-based in their appeal, issues that have to do with good governance rather than with cleavages and narrow identities might start to surface in the country. Due to some internal sabotage the committee watered down their recommendation and said they support the issue, but further discussion is recommended. In 2001, in a consultation paper (http://lawmin.nic.in/ncrwc/finalreport/v2b1-9.htm) they actually strongly rooted for it. If Namo and his team can get this one law passed, they will change India forever. We need to push this government to the extreme to ensure that this law gets passed. It will eliminate regional parties and manchurians controlled by foreign govts for ever. It will also end minority appeasement and bring governance issues to the focus. ^^^ to add to the above. 2. Regional parties who are dominant in their state have no reason to worry, as this change will not affect them. The parties that will be most affected are those who win with 20-30% vote in their state (read sp, bsp, jdu, rjd etc). So a BJD/TDP/ADMK need not worry, as they will anyway win even in a run off contest. As you will see, it is these parties that win with 20-30% vote that are bereft of any development agent and only win votes with entrenched vote banks. Congress likes to prop up new ones like PRP/MNS who will also appeal to a vote bank and cut opposition votes. Guess what, with this law, all these guys are toast, at every seat level it will be a straight contest between the top 2 parties in the 2nd round if the 1st round does not give a clear winner (with more than 50% vote). 3. This is clearly not a radical idea, it was proposed within 1 year after formation of the 1999 govt. I am not privy to the details as to why the process did not get implemented after the final report was submitted in 2002. Maybe some regional parties who were supporting BJP opposed it. But now if they get a decent mandate, they can pass this bill even with the support of BJD/TDP/ADMK who all stand to benefit from this. 4. There will be some opposition to this from certain BJP MP's (primarily those from delhi/punjab/haryana) who are winning solely because AAP has split the congress vote to help BJP win. That issue needs to be handled. johneeG wrote: BTW, there is a bigger lesson here: It is only Hindhuthva(or hindhuism) that actually helps all castes. And Hindhuthva + development is the winning formula. Now, there are no excuses for the lotus to not implement all that it has promised in manifesto. (3) an Indian culture that distrusts dogma of any kind. The BJP didn't even do a good job as opposition party in parliament, so it needs to really work on (1). On (2), the BJP scores high. Narendrabhai Damodardas Modi wins the Lok Sabha Elections 2014! Bharat is awake. Dharma reigns again over the Throne of Bharat! NaMo Samvat begins with the coronation of Samrat Narendra Modi! RajeshA wrote: Narendrabhai Damodardas Modi wins the Lok Sabha Elections 2014!Bharat is awake. Dharma reigns again over the Throne of Bharat! NaMo Samvat begins with the coronation of Samrat Narendra Modi! Finally the ghots of GanguJammuni Bhoj is exorcised by ModiMantraMala and Holy Ganga Water-Boarding techinque. Gandhi ji dreamed of a #CommonScript across India. I spoke with Prof. Srinivasa yesterday. He explained that this was conceived as part of OCR efforts for Indian languages at a few research instts in India. The script appears very mathematical in how the characters are designed, and so lends itself naturally to machine readability. It doesn't look terribly beautiful to me, though (I have a thing for calligraphy - love Chinese and Perso-Arabic calligraphy). There are about 9 scripts currently used across India. The good proff says that even if no one wants to adopt such a common script, it can be used as a standard that can easily be converted to any other script at the click of a button. Besides, anyone can learn the script in under an hour. Becomes useful for public signs, etc across India. I was thinking that if a common script should evolve, it would probably be a sort of "Devanagari 2.0". When the Marathas became a pan-India empire, they switched from an older (and more shorthand) Modi (मोडी) script to Devanagari, probably for political expedience - as the compliance gradient would have been steep if they introduced a different script. But given the technologies and educational networks that exist today, the compliance gradient is different... Thoughts? I have been advocating this for so many years on BRF..
We need to increase the %age of voting in India. Some efforts have been made in India, e.g. in Gujarat, by introducing compulsory voting. However providing incentives can work just as effectively and bureaucratic outlays for both may alternatives - compulsory and incentivized voting may not be too far apart. Virupaksha wrote: In UP, mayawati's vote bank is safe. Its just that her and mulayam's vote bank calculations work with a 50% turnout (2009 was 47% turnout), but those get thrown into dustbin with 58.29% turnout which we got in 2014. It is that extra 11% vote which went entirely to modi which made all the difference. BSP vote count has increased around 8 lakh which is just around the usual population increase range. So BSP has neither lost nor gained any vote. Congress vote count decreased by 40 lakhs, which with the population increase means it has lost around 45 lakh. SP vote count increased by 50 lakhs, which with population increase means it gained 45 lakh. This is the entire 45 lakh which congress lost. So about 40% of vote of congress was seamlessly transferred to congress. I would render a guess that this is the consolidation of muslim and yadav vote. The others lost numerically around 8 lakh votes which with population increase can be estimated to be around 12 lakhs. As of now, if there was the same voter turnout as in 2009, there is only a floating vote of 12 lakhs. What threw everything of those perfect caste calculations and consolidations in the spanner? It is the 11% increase in votes polled. This 11% went entirely to BJP. BJP had a oping increase of 2 crore 47 lakh voters. With 12 lakhs of others and 8 lakhs of usual population increase taking out, it results in a stupendous increase of 2 crores 27 lakh new voters getting off their a$$es and ALL of them voting for BJP. So reading the results will imply that that the SP, BSPs are still going strong and have suffered no setback. Infact SP actually gained. But as with any casteist party, their whole calculus goes down the drain the moment voter turnout hits around 60%. This gives rise to a very simple solution to defeat the casteist parties. Get the people to vote. my suggestion would be that perhaps this MNREGA can be changed to a voter incentives program. Any voter who goes out and votes gets some credits which he can use to claim some benefits. For the poor, it can be say a 1000 Rs on the hand. For the middle class it could be some tax concessions! To cut on bureaucracy and misuse of it to make determination between middle class and poor, both incentives can be made available both population groups. It would spike the costs for an election, but democracy would be strengthened, and voting %ages would rise. More importantly all those who get to enjoy the fruits of development would not turn apathetic and continue to reward politicians who deliver on development and good governance. It would make the democratic exercise of elections a central issue in the lives of people. It is true that in India, voting percentage is often higher than in the West and more so is the interest in politics, but such incentives could create a even better connect between democracy and demography. Atri wrote: I have been advocating this for so many years on BRF..
Atri ji, which one? A new neurolinguistic-mapped script? Or Devanagari++? As per Wikipedia, even many Muslims deem Hajj subsidy as Unislamic as Muslims are supposed to do Hajj using their own resources. Considerable criticism has been levelled against this practice, both by Hindu organisations opposed to state funding of private pilgrimage outside India and by Muslim pressure groups. As an example of the latter, Mohib Ahmad contends that even Air India's subsidised fare is higher than competing airlines' ordinary fare. However, the government has continued offering the Haj subsidy despite protests from the Muslim community at large. Syed Shahabuddin claims that Air India's rising costs for travel, and the consequent increases in the Government of India's subsidy, have resulted partly from differences in foreign exchange rates beyond the airline's control. He suggests charter fares should be set at two-thirds of regular IATA fares, but points out that the Haj has higher costs than other charters because two empty flights are required to return the aircraft to India and to position the aircraft in Arabia for the pilgrims' return journey. Shahabuddin maintains that the subsidy ought to be phased out because Hindus view the subsidy as preferential treatment of India's Muslim minority. Zafarul Islam Khan states that,"Muslims in general are not in favour of the Hajj subsidy. We consider the subsidy as a subsidy to Air India and not to the Muslim community." Other Muslim leaders have argued that the Hajj subsidy is "un-Islamic" and that Hajj money should be invested in education and health instead. Maulana Mahmood A. Madani, a member of the Rajya Sabha and general secretary of the Jamiat-e-Ulema-e-Hind, declared that the Hajj subsidy is a technical violation of Islamic Sharia, since the Koran declares that Hajj should be performed by Muslims using their own resources. Influential Muslim lobbies in India have regularly insisted that the Hajj subsidy should be phased out as it is UnIslamic. Likewise, Hindu groups argue that a government sponsored Hajj subsidy forcibly taxes Hindus to pay for Muslim religious pilgrimages, and is tantamount to appeasement of Islam. Doing away with this subsidy should be no big problem for the Bharatiya Sarkar, citing criticism for such a practice from Muslims themselves. What the govt. can do is set up a Hajj Fund into which all philanthropic Indian Muslims and other Seculars can pay into as charity, and this fund can be used by Muslims wishing to do Hajj. Or, any government subsidy for Hajj yatra can be made available only via Air India. I think disha ji once suggested that. RajeshA ji, but the voter percentage had gone up in the Delhi Assembly elections too and you saw what happened - utter bunder baant. We had about 9-10% jump in the General Elections. My hypothesis is a bit more complex. People move around to crystallize around their pet ideas whenever a proposal is presented. Elections have proposals flying left and right so people take even more entrenched positions. If you want to use the cooperation of the people, via electoral system, to do away with the ills plaguing India, then you have to get the people of nationalist bent of mind interested. And these people have high and different hopes ergo they lose heart when they see compromises and incompetance. Even a poor nationalist is not going to get excited by 1000 Rupees. In my case I cannot be enthused enough by tax refunds etc. People got motivated by Promises. Even a lame party like got results when they promised. In the case of Congress people had already believed their promises 5 years back and now by/in 2014 they decided they are not impressed with the results. People understand an election as a bet. If its a bad bet they will feel bad about it later. Only a good performance and communication will enable similar results in future. In fact people esp. of the nationalist bent see elections as an event where they contribute with money and labor. They want to expend, rather invest. In urban India all parties are forced to make the better governance and development case. Identity politics, at least Jati identity politics, plays a much smaller role. AAP made the better case against Sheila Dixit govt. than the BJP, packaged as a protest, so they won. Of course it helped that it was a fixed match. However all over India, problem for Bharatiyas is that local identity and loyalty politics often defeats the collective progress message. Just intuitively I would say that in a region of low voting %ages, first 30% of voters would be party's core voters and they will come out anyway. When the voting %age hovers around 50% it is still based on group identity and loyalty voting. It is only when the voting %age starts hitting 60% upwards, that it becomes issue based - good governance, development, national security, etc., because these voters need to be really convinced. My suggestion is to pull these issue-based voter demographic more into the electoral exercise by giving them further incentives. "..because after all how we present ourselves to the world, based on fundamental memes of our civilizational history, is also of prime importance to the rest of the world and would surely, if not in the next decade, in the decades after that influence our policies towards other countries as well." Now I have seen it all from Edwina's nose hairs (Sherwood Forest) as I fearfully proffered her flowers, to VKKM falling head first into his rice bowl (apparently he did that quite a lot)during dinners. This struck me as being to the right of my weirdometer gauge. The senior leader has seen it all and done it all in what is called Congress culture. He and other Congress leaders shared with Rediff.com insights into Modi's victory that, obviously, even BJP leaders may not be able to replicate. The experience counts in the matter of political diagnosis. Sonia Gandhi's ascension to power in the Congress in 1998 came amidst the issue of her foreign origin, the re-acceptance of dynastic politics by the party, sharpening of the Congress stand on secular issues that were sometimes taken to extremes, as it happened in the way the Sachar committee report on Muslims was handled, politically. Sonia's politics veer around government policy to favour the poor and minorities to such an extent that Rahul Gandhi seriously started believing that the Direct Cash Transfer scheme was a game-changer that would get the Congress around 250 seats, reveals the Congress leader. Justifiably, Rahul Gandhi is seen as the main culprit who has dispatched the Congress party to the graveyard. To rise again, Rahul will have to learn the ways of the Congress, the leader feels. In view of the completely desi appeal of Modi's campaign some people now seriously question if there is a Western influence inside Rahul's office that recommends actions without knowing Indian realities. Rahul would like to build up the party from scratch, but how can he clear the Congress liabilities when his own balance sheet shows a nil balance? A fight has broken out between the two forces. Rahul and his team want to blame the old daddies and the UPA government's corruption for the party's shameful performance, while 24, Akbar Road's biggies want to point out that Rahul's politics lacks an 'Indian' touch and Modi has gained precisely because he understood the majority -- the Hindus. The Congress defeat speaks clearly and loudly that the dynasty that won votes in 2004 and 2009 failed because of its arrogance. Their 'We are born to rule' attitude has been rejected in the era of Twitter and 24 hours news television channels that dissect and blast every little act by political leaders. It is not surprising that Congress leaders now understand the deep effect and disastrous dynamics of the Gandhi family's decision to anoint Rahul Gandhi as its general going into electoral war. While the Italy-born party president Sonia Gandhi kept a low profile for the last 10 years, she went overboard to protect and launch her son in the party that obviously deserved better. Certainly, among Priyanka, Rahul and Sonia Gandhi, Sonia's image is not tainted, even now, among Congressmen. But now she is being accused, privately, of protecting her son at the cost of the party's interest. Many Congressmen forcefully argue that they have the wherewithal to fight the BJP any day, any time, but Modi resorted to 'Bhartiyata' and captured the imagination of the voters, besides doing many other things. Precisely for this, Congressmen find huge problems with Rahul's 'Western-type' behaviour. Modi's temple visits, his idiom, his oratory and his use of local phrases ensured that "he was not a stranger to the people." Even most voters who didn't understand Modi's language felt "he is one of us." Even after the election, Modi is monopolising "Indian-ness" in political events as he did during the campaign. His Ganga aarti in Varanasi on May 17, the way he bowed down at the steps of Parliament on May 20 were actions that cannot be dubbed acts of fanatical Hindutva. It is Bhartiyata for Indian voters, says the Congress leader pained to see his party's downfall. Congress and secular pundits kept debating BJP leader Amit Shah's Hindutva agenda, but Modi has arrived in New Delhi with the politics of Bhartiyata. According to the exclusive insights that Rediff.com has, Rahul Gandhi is not likely to get away with his dismal performance of 44 Lok Sabha seats. It seems the grand old party will ensure that he changes his way and "takes the party" along with him. After the Budget session of the new Lok Sabha, he is likely to be told: Improve or be banished. For the first time ever, 24 Akbar Road, the party's headquarters, is assessing the neeyat (intent) of the Gandhi Parivar, which has never happened before. No journalist on the Congress beat has ever heard such words in the party against the Gandhis. That such expressions are emerging out of the Congress's internal churning, is a huge thing. Congressmen understand what Modi's arrival brings to New Delhi. The party is alerting Rahul and Priyanka Gandhi that even if they think they are born to rule and can continue with their snooty ways, then they will confront a reality check sooner than later. Sonia Gandhi is still respected among defeated partymen, but she is not in a strong enough position to encash her goodwill to keep pushing her son within the party that finds itself in an existential battle. All these years the Nehru-Gandhis delivered votes and the party in turn provided unflinching loyalty. It was a mutually beneficial deal. But Rahul Gandhi's repeated failure is likely to change the Congress course. Inside the party, a tsunami of anger has erupted. It does not reach the media because the Congress has been so completely demolished that its leaders have enough time to plan their rebellion. In fact, not many senior Congress leaders are shocked by the result; many of them felt the party would get around 70 seats or below. Many Congressmen could see the failure of the government, Cabinet ministers and Rahul Gandhi in every which way. It is unlikely that Sonia Gandhi was unaware of the pending disaster either. Congress leaders dubbed Modi as a leader who polarises the country, but his victory shows that a lot of Modi's symbolism, which was dubbed as 'communal Hindutva', has been accepted by millions of voters as 'Bhartiyata'. Even if this is deception of the highest order, it has worked for the BJP. When Mani Shankar Aiyar insulted Modi at the January session of the All India Congress Committee and said at the most he could open a tea stall at the venue, just a few hours later Rahul Gandhi cheered Aiyar for his role in creating the Panchayati Raj Act. No politician can get more arrogant than this. When in Snoopgate the girl the Modi government allegedly spied on was reluctant to make it an issue and when her father came out declaring total support for Modi, Rahul Gandhi did not have a clue that the issue was not politically viable anymore. When Modi touches the dharti (ground) of Parliament he does not look strange. Even a Congress leader feels, "He doesn't look ajooba (strange)." But Rahul Gandhi and Priyanka do -- that is the brutal assessment that has dawned on Congressmen, a bit late in the day. Many Congressmen, furious with Rahul Gandhi and his ways of things, add that since they won the 2009 mandate there is no enthusiasm in the country. The way a euphoria has accompanied Modi's triumph, no such hysteria enveloped Manmohan Singh then, they say. A more serious setback was the way many ministers lost their credibility. From P Chidambaram and Kapil Sibal to Jairam Ramesh, these leaders turned into hate figures. On social media they were hooted, while within the country they didn't get heartfelt respect even for the first few months. The image percolated down that some ministers were looting the country. This impression could never be countered, and things got worse after Modi embarked on his whirlwind campaign. It is untrue that the Congress did not spend money on its election campaign. Any party that has been in power for 10 years would have money. Modi obviously spent a massive amount of money, but that alone cannot make one a prime minister, Congressmen now argue. Will the dynasty remain at the centre of the Congress? If the Congress thinks that "Bhartiyata ki jeet hui hain", then it is obvious that the party will take the reins in its hands to see how things go with the Gandhis and how much is their flexibility to accommodate the Congress need to understand a majority of Indians. Also, without an acknowledgement of Indian-ness that has been more the Congress trademark than any other party's, the Congress knows there is no scope of revival. Why the panic about reading some ancient Bharatiya literature? There we go again. Barely days into power and the BJP is already into tinkering with school textbooks to bring them in line with its Hindu-centred worldview. Smriti Irani has opened her account as the Human Resources Development Minister by announcing plans to give a "Hindu perspective" to school curriculum, setting the stage for a fresh round of hostilities in the old phoney culture war between the Left and the Right. Or as one commentator put it, the “New Right’’ and the “Old Left’’. Irani may have been a surprise choice to head the HRD ministry, given her featherweight political status and zero experience in government, but she clearly knows the script well and has stuck to it with the zeal of a new mullah. Details of her plans are rather hush-hush. All that is officially known is that she is "keen" to include "ancient Hindu texts" in the syllabus for classes 8th, 9th and 10th. Indeed, she is reported to have already set up a committee which will study ancient literary works such as the Upanishads and the Vedas and identify suitable texts highlighting the Hindu contribution to science, mathematics and philosophy. According to media reports, officials have been asked to develop teaching material “encapsulating’’ the glories of the Hindu “golden age’’. On the face of it, there's nothing wrong with it. Though I believe ancient India is already taught in history classes, never mind. Anything that broadens pupils' horizons should be welcomed. But look closely at the small print, as it were, and the history of previous such efforts and you begin to doubt if the move is really as innocuous as it is cracked up to be. 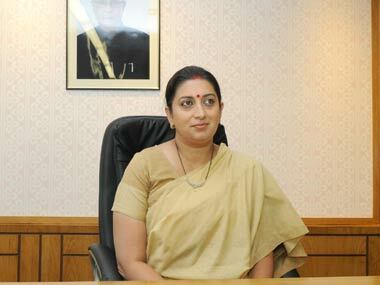 Smriit Irani taking charge of HRD ministry. PIB What Irani is propounding as her own simple idea --“her desire to preserve the ancient culture and heritage of the country”, as one official is quoted as saying –is in fact an RSS project and has its fingerprints all over it. Official pretence to the contrary notwithstanding, everyone knows where it is all coming from. As Deccan Chronicle pointed out, the move is "being viewed as an attempt by the government to push through the RSS’ educational revamp agenda…The RSS has been critical of the Congress governments for ignoring the contribution of Hindu culture and religion to nation-building. The rightist organisations have labelled current textbooks as Left-leaning". “Saffronisation’’ of education has been a pet RSS project dressed up as a campaign to purge textbooks of “foreign’’ influences, and to promote “patriotism’’. It was taken up with extraordinary zeal by RSS-loyalist Murali Manohar Joshi when he headed the ministry. There was extensive revision of NCERT books and pro-RSS historians were brought in to prepare heavily nationalistic teaching material. Key educational bodies, including the NCERT and the Indian Council of Historical Research, were “reconstituted’’ and packed with people sympathetic to the BJP thinking. As someone who covered the HRD ministry at the time I still remember the controversies Dr Joshi’s action generated. He faced a virtual revolt from non-BJP state governments many of whom refused to introduce new NCERT books which they claimed were full of factual errors. So Irani is, in effect, picking up where he left. A clear giveaway as to who is driving the agenda is the role of the RSS-affiliated Shiksha Sanskriti Utthan Nyas (SSUN) which has demanded a “total change’’ in school education. Its lead campaigner is RSS pracharak Dinanath Batra who also runs the controversial Shiksha Bachao Andolan,which has earned notoriety for seeking ban on any book it regards “anti-Hindu’’. It is important to remember that Batra was also the driving force behind Dr Joshi's "reforms". And he is back with a bang. Shortly before Irani announced her plans, he let it be known that he planned to meet Prime Minister Narendra Modi and push for a “revamp’’ of education. "I am meeting Narendra Modiji after the swearing-in. We have already sent our demands. Political change has taken place, now there should be total revamp of education," he told The Times of India. Mark the words, “will be rewritten’’. No “ifs’’ and “buts’’. So,the writing on the wall is clear. It's not going to end with a few bland chapters on ancient India. Irani's move is the first salvo towards finishing the unfinished business started by Dr Joshi . Fears that it could be the start of a slippery slope towards "Hindutvisation " of the education system are real. There are reports that academics are busy downloading NCERT textbooks fearing that they might be withdrawn. They may be accused of over-reaction but in the light of what happened under Dr Joshi can they be really blamed for panicking? Communalisation or not, he is right in emphasising that the focus should be on institutional reform rather than tinkering with books. It is simply amazing that given the myriad problems facing the government school sector—a shocking lack of infrastructural facilities, poorly qualified and indifferent teachers, low enrolment, high dropout rate—the first thing that the new HRD minister chooses to do is talk about introducing “Hindu perspective’’. Dr Joshi was often derisively dismissed as someone stuck in a time warp because of his age and old-fashioned style, but how does one explain such lopsided priorities coming from a young and supposedly “dynamic’’ minister brought in to clear the “mess’’ blamed on the UPA government? Either she is hopelessly incompetent and has no understanding of her complex brief,or she is simply doing the RSS bidding. My money is on the latter possibility for reasons I’ve already stated. Either way she is not the best of advertisements for a government that claims to be flush with talent and is desperately trying to project a moderate image. Just when one thought that the Modi sarkar was making all the right noises she has ended up reviving anxieties about its real agenda. Meanwhile, emboldened by the BJP victory Mr Batra has struck again. After forcing Penguin to pulp Wendy Doniger’s book on Hinduism, he and his organisation are now seeking withdrawal of Sekhar Bandopadhyay’s popular textbook, Plassey to Partition: A History of Modern India, claiming that it is defamatory and derogatory to the RSS. Its knock-on result has been that in sheer panic its publisher, Orient Blackswan, has decided to “set aside” (an euphemism for temporary withdhrawal) Oxford Rhodes scholar Megha Kumar’s book, [i]Communalism and Sexual Violence: Ahmedabad Since 1969[/i]. How about a chapter on “free speech in ancient India’’ in the new textbooks Irani has ordered? >>How about a chapter on “free speech in ancient India’’ in the new textbooks Irani has ordered? Hasan Suroor would be well advised to do some research, or perhaps have a chat with Salman Rushdie... He may wish to read this blog, and listen to what Rushdie says about freedom of speech in ancient India in the embedded video there. Now, most likely Smriti Irani won't have any objections to having that in the textbooks. Question is will it be a problem for Mr. Suroor if, in the same vein, a thorough discussion of freedom of speech in Islamic countries today (let alone in Mohammed's time) will be alright with him. It's easy to pontificate from London (where I think he's based, if it is the same Hasan Suroor), quite another to do so from under the watchful eye of the Custodian of the Two Holy Shrines sitting in Riyadh. I just heard Pranab Mukherji lay out the Modi govt's priorities. Incredibly disappointed at the Language Policy action plan so far. It has been lumped in with "heritage" and "tourism"! The grand action plan is to translate some of the classics into several Prakrits. Its such a colonized mindset, lumping in the languages of the masses with "tourism". Instead of talking about providing higher education, etc in all languages without discrimination against non-English medium students, this is all they offer? If this is all there is to Language Policy, then IMHO it is a very backward looking rather than futuristic Hindutva take on Language so far - which is the software of a society. Will wait and watch. Vedic Chanting is recognized by the "international community" as the cultural heritage of humanity. So it is incumbent upon the Ministry for Tourism and Culture as well as Ministry of Human Resources Development to do everything to preserve this heritage. It is their SECULAR duty to do so! As such one should expect both the ministries to provide sufficient funds, facilities, scholarships and incentives to children in normal schools and special Gurukuls to learn Vedic Chanting! It is a pity that the earlier governments in India have not done so! Nothing "religious" should be inferred from such a program designed to preserving the cultural heritage of whole humanity. ^^^ RajeshA ji, I'm not sure this would help in anyway without pre-requisite groundwork. Mere preservation can be done digitally also. There's little to be gained by chanting "Veda" without approaching it through the study of the Vedangas and practice of those disciplines. In order to properly study Vedangas, etc, Sanskrit is required. Sanskrit is best approached through the Prakrits, as both need one another to thrive. Therefore the first brick to lay in support of Vedic Yajna is Language Policy. Without that, this "preserving heritage" business is backward looking and not befitting government-level policy. Dharmic sansthas can do it with tax breaks and other support from government. Agnimitra wrote: ^^^ RajeshA ji, I'm not sure this would help in anyway without pre-requisite groundwork. Mere preservation can be done digitally also. There's little to be gained by chanting "Veda" without approaching it through the study of the Vedangas and practice of those disciplines. In order to properly study Vedangas, etc, Sanskrit is required. Sanskrit is best approached through the Prakrits, as both need one another to thrive. Therefore the first brick to lay in support of Vedic Yajna is Language Policy. Without that, this "preserving heritage" business is backward looking and not befitting government-level policy. Dharmic sansthas can do it with tax breaks and other support from government. UNESCO recognizes Vedic Chanting as Intangible Cultural Heritage of Humanity in its practiced form and not as a digital archive. Sanskrit and Vedangas are necessary prerequisites for preserving this heritage and have in the past been considered integral part of the teaching of Vedic Chanting, so of course they too would have to be promoted. But all this is all SECULAR, because UNESCO stamp says so!